Screenwriter Peter Bowker says that he stumbled through the novel in his teenage years: “My first strong memory is of the black and white Hollywood film, but I read it at university and I adored it…….. I had to return to my brutal younger self when I was choosing what to cut and what not to cut. The book is the work, of course, and I am doing a take on it, what a musician calls a cover version………ultimately, it is a redemptive version……..
We watch a clip, one of several. Heathcliff looks at the fresh gravestone for Catherine Linton and starts wielding his spade, watched by a distant figure behind an upstairs window. He reaches the wood of the coffin lid quickly and tears it open with ease. Cathy’s beautiful face is in his mind, and he sees it down there, but there’s also a glimpse of a skull. Coky Giedroyc speaks: “It seems sacred…..a lot of people think they own the characters……. “Writing it felt like a conversation with Emily Brontë…..there are certain key speeches which can’t be lost…..it’s more of an extended prose poem than a novel……….I often put the dialogue reported by Nelly Dean back into the characters’ mouths” says Peter Bowker. “Casting was a long journey………we needed a brave and dangerous performer for Heathcliff……there’s few that can do it, but there’s so many who want to do it. I was getting live links from LA. I was confident that Tom Hardy would be brave……and grubby and……a little bit random. He played that graveyard scene absolutely from his solar plexus…..you have to embrace the gothic but also the emotional truth. We watch a clip set in Thrushcross Grange. Nelly comes in gasping as Heathcliff threatens Edgar with a poker. Emily Brontë does not write all that much about Thrushcross, but there’s plenty of detail here. It speaks of a squire’s wealth, but it is pale and quiet, calm and comfortable in contrast to Wuthering Heights. Question time arrives. A woman thanks the pair at the front for providing her eight year-old daughter (who is with her) with an excellent experience. She has watched the DVD several times. There is a question about the novel’s ambiguity. In the novel it is not clear what Cathy and Heathcliff actually do with each other. Does Cathy really understand what she is doing anyway? Why is their relationship so steamy in this television version? “We had to strip away the ambiguity to make the story work on screen,” comes the reply from Peter Bowker. Not only is the half-term holiday a great opportunity to see some fantastic exhibitions at the Parsonage, it’s also a chance to enjoy special discount entry. Throughout the half-term week, two for one vouchers will be available at various locations around the village, allowing two visitors to enter for the price of one. Visitors will have a last chance to view Ghosts, an exhibition of atmospheric landscape photographs by major British artist, SamTaylor-Wood. The exhibition is a response to Wuthering Heights and will close on 2 November. The Ghosts exhibition has proved very popular with visitors this summer. It is unusual to find the work of such an important contemporary artist in an historic environment such as the Parsonage, and many visitors have commented that the works are like windows on to the moors, and the dramatic landscape that the Brontës knew and wrote about in their novels. We hope that people will take this last opportunity to see the works hung within the museum, before the series of photographs is returned to London. Bafta-winning screenwriter Peter Bowker and director Coky Giedroyc will be visiting Haworth to talk about their recent work adapting Wuthering Heights for ITV1. 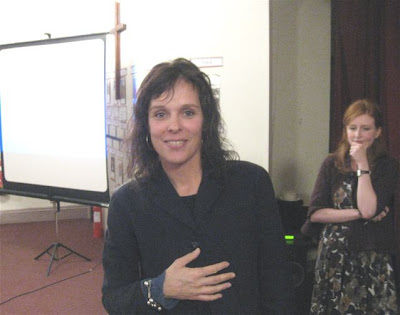 The special event will take place on this coming Saturday (24 October) at 7pm at the West Lane Baptist Centre in Haworth, and will look at the process of adapting the novel for television, as well as behind the scenes information about making and filming the drama production. We’ve had a lot of interest in the ITV production from visitors, especially with the costumes being on show at the Parsonage. It will be fascinating to hear how a drama like this is put together, and the ways in which Peter Bowker and Coky Giedroyc have adapted the story of Wuthering Heights for a twenty-first century audience. Peter Bowker wrote Blackpool for the BBC and won a BAFTA for his 2001 ITV movie Buried Treasure. His television film Flesh and Blood won the Prix Europa and two Royal Television Society awards in 2002. Peter Bowker’s three part drama Occupation about three British soldiers serving in Iraq was shown on BBC1 earlier this year and he also wrote the recent Desperate Romantics for the BBC. Coky Giedroyc has directed numerous dramas for television, including the BAFTA-nominated The Virgin Queen (2006) and Oliver Twist (2007) for BBC television. 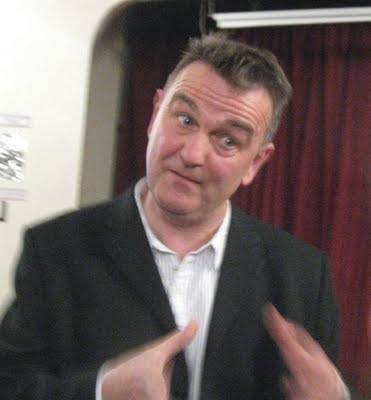 She also directed Peter Bowker’s Blackpool in 2004. Tickets are £10 and can be booked from the Brontë Parsonage Museum by contacting the Arts Officer: jenna.holmes@bronte.org.uk / 01535 640188. For further information contact jenna.holmes@bronte.org.uk / 01535 640188. Few English villages can have been as well documented and photographed as Haworth, a place with more significant connotations than most of the others. A recent publication is the latest in a series which uses the old pictures next to the new ones to show how things have changed, and not always for the better. 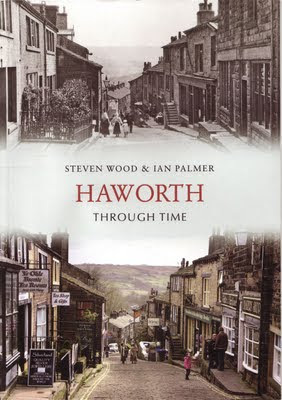 The title is Haworth Through Time, and it is by Steven Wood and photographer Ian Palmer. Its brief introduction puts the causes of the many changes into a nutshell. It is explained, for example, that the first development of Main Street was brought about by the making of the Blue Bell turnpike through Haworth in 1755, and that the reason for the large number of non-conformist chapels in the Haworth area is because one of the charismatic leaders of the evangelical revival, William Grimshaw, was the local minister. The major nineteenth century expansions were caused by the opening of the branch railway from Keighley in 1867, which also made it necessary to alter the road system in the lower part of the village. A point sometimes missed by students of the Brontës and by some scholars as well, is that Haworth was until well into the twentieth century a hectic, industrialised part of Yorkshire, and a generally unhealthy place for those people packed into small rooms where they lived, worked hard and died, apart from the folk up at the Parsonage. It was not at the far end of beyond. Many industries and the quarries have of course collapsed now, and at one time the railway itself was closed – until it was reopened by a preservation society. Today, so many people have cars, and Haworth is a healthy and desirable place for commuters and families to put down roots. Main Street is full of little shops and cafés geared to the tourist trade, and a good place to stroll along, even though it is not yet a pedestrian precinct, and cars can often be observed going unnecessarily fast along it. The cars were a problem for Ian Palmer too – he had to put up with their obscuring of many views of course, and apparently had to dodge one or two while pointing his camera, and no doubt holding in one hand the old photograph so that the new one could be taken from the same vantage point. One surprising thing to note in the new colour images is the number of trees. They appear to have multiplied. For example, in a view entitled Haworth from Brow, the increase in the numbers of houses for mill workers dating from the late nineteenth century can be clearly seen, and they are now accompanied by large numbers of verdant trunks and branches. In the old photo, Ivy Bank Mill with a smoking chimney is visible on the left. The chimney has gone, of course, along with thousands of others across Yorkshire, mainly demolished in the 1960s, and the background landscape looks windswept and bare. Ivy Bank mill is now a burnt out ruin. A view of Church Street and Changegate from the Church Tower taken at the time of the Great War shows huddled buildings (usually described as ‘slums’) and a lack of modern roads. These can be seen in the up-to-date view. An old photo dating from 1960 of Acton Street shows a row of houses now demolished where once lived Old Jack Kay, who was known as the village wise man. Did every village have one of these? Old Jack could foretell and even control the weather, so it was said, and defeat the evil created by witches. Not many people come into the old or the new photos, but an exception is Smithy in the Fold, c1900, in which four well-built men can be seen posing casually – blacksmiths Abraham Scarborough and his son Herbert, along with two other smiths. Their smithy is now a garage. And the most photographed building in Haworth has to be there as well, naturally – a well-known sepia image of the Parsonage from about 186o is set above a present-day view with tall trees in the foreground. There are more than 180 photographs in this book, which is published by Amberley Publishing at £12.99.